Tate’s Trey LaFleur threw a no-hitter Thursday in a 10-0 win on the fifth anniversary of Pitching Coach JT Granat’s no-hitter against Escambia. Throwing a no-hitter is a career accomplishment one never forgets, and on Thursday night Tate junior Trey LaFleur cemented a very special place in program history by throwing a no-hitter on the fifth anniversary of another Tate no-hitter. 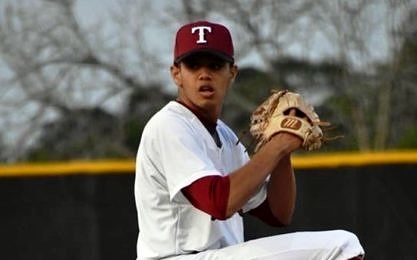 Exactly five years ago current Aggies Pitching Coach JT Granat threw a no-hitter in a victory over Escambia, and on Thursday LaFleur registered his no-no in a 10-0 district victory over the Booker T. Washington Wildcats. The one difference between the two performances is that Granat actually threw a perfect game, facing the minimum 21 batters in a 3-0 victory over the Gators. LaFleur issued three walks and hit one batter, but he piled up 10 strikeouts compared to the five punch outs Granat registered in his moment in 2013. LaFleur now has 38 strikeouts on the season, which already nearly matches his total from a year ago. The victory comes at a key time for the Aggies (12-5), as it helps keep pace in 7A-1 with a 2-1 mark, good for second place currently. Tate plays five straight district games from here, including a pair against district leader Pace. With LaFleur holding the Wildcats (7-9) at bay, the offense did its job with plenty of run support to close things out in six innings. Senior infielder Jesse Sherrill led the way in going 3-for-4 with an RBI and two runs and Mason Land went 2-for-3 with a double, two RBIs and a run. Trent Jeffcoat was 2-for-2 with a double, an RBI and a run and Blake Anderson went 2-for-4 with two runs.